Why, How, and What for.. I have been choosing three words to guide me now since 2016 and my guest has been doing it for a few more years. Learn Why, How, we choose words and then listen to the words we both choose and the meaning they bring to us. Why do you choose 3 words to guide you? What are you 3 words and why? Scott is an executive and career coach. He frames issues so people can take action and achieve their goals. He works with individuals and teams to see new patterns and create alternative ways to move forward. 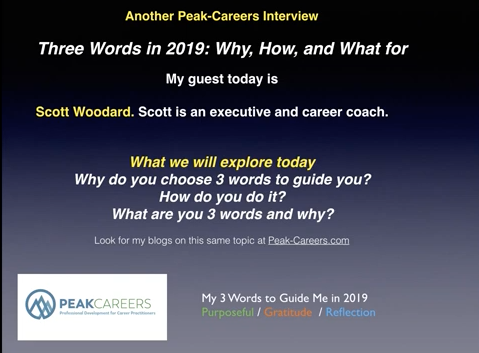 Scott has coached people from all walks of life: corporate executives and elected officials challenged to transform their organizations; Boomers trying to determine the “second acts” of their life, and new graduates starting out in their first career.